I haven’t finished the second book yet, but since writing this I’ve found the legend of King Arthur being threaded through the last half of Thief’s Daughter. Squee! 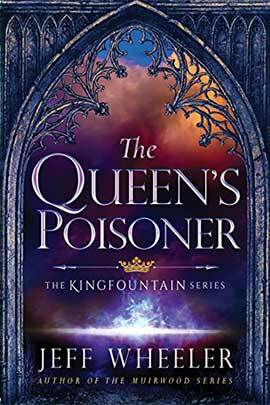 I got the Queen’s Poisoner based on your recommendation. It’s pretty good. I was afraid at first it was falling into the cliche of having all the bad guys be ugly/deformed and all the good guys radiantly beautiful, but things turned out to be more complex than they appeared at first, which is always good. Some other historical tidbits that popped out at me: the Maid of Donremy is Joan of Arc (who in the real world was born in Domremy), and Mancini’s political philosophy (especially the bit where he says men will forget the murder of their fathers before they forget the theft of their patrimonies) is largely cribbed from Niccolo Machiavelli’s The Prince. Did you also notice I summarized the book with incorrect info? That’s what comes of waiting far too long to read book 2 in a series. There was a statement in book 1 that bothered me because I don’t think the verb “to lie” was conjugated correctly. I noted it, but I lost my note, so I’d have to go back and find it. I admit, I’ve always been a bit bemused by ‘bemused.’ It has a vague connotation that the one bemused is rather fond of the one who is confusing them, doesn’t it? Not sure. However, I’ve since come to envision being bemused as being both confused and amused, like you can’t decide if what you are seeing/hearing is supposed to be a joke or not (amused confusion, or perhaps confused amusion). That’s not really what it means, but I guess I am influenced by writers constantly using it in ignorance as a synonym for amused, so for me it has taken on an “amused” connotation to go with the “confused” denotation. Fun fact I did not know until just now: “bemused” meaning “confused” was not the original meaning of that word either, and was also a result of a popular misunderstanding. The poet Alexander Pope coined the word “bemused” with the phrase “much bemus’d in beer” (describing himself), by which he meant he drew his inspiration (i.e. his “muse”) from booze. But people misunderstood that phrase to mean “much confused by beer” (i.e. simply drunk all the time). So “confused” became the accepted meaning of “bemused”, but then later generations misunderstood the misunderstanding as “amused”. What a bemusing word-origin story, eh? Re: “to lie”, I have a vague recollection that there were other usage/grammar issues (besides “bemused”), but I don’t remember specifically what they were, and didn’t take notes. No, wait! There was one additional usage issue I remember that was almost as irritating as “bemused”. And that is the strange way the author used the word “stack” more than once as meaning “to line up horizontally”. Owen “stacked” chess Wizr pieces in their starting positions and also “stacked” dominoes tiles in rows and patterns before knocking them down. This odd use of “stack” was very bemusing to me– I was like a fourth of the way through the book before I realized Owen’s tiles were dominoes, not Jenga blocks. You know, I was throw off by that, too! I kept seeing pieces like slate being piled on each other until it mentioned a design.